Financial betting could not be easier with William Hill’s new Day Trader service, whether it is Fixed Odds or Binary Betting that interests you, they cater for everyone from beginners to more experienced financial bettors. Day Trader allows punters to have a crack at indices, commodities and currency pairs in financial trading. To make things even more attractive, William Hill is running a promotion where they will refund £25 of losses a punter makes on his first trading day. Day Trader allows you to place bets on the movement of financial markets including Commodities, Market Indices, Forex Exchange pairs and Market Equities with one of the most innovative and user friendly applications. Day Trader offers a wide range of markets to trade on with up to 132 different betting opportunities available per instrument at any one time, offering both traditional Fixed Odds Financial Betting and Binary Betting. Day Trader also allows you to close out any of your open positions after they have been placed until the time the market closes. Through our bet slip feature you are able to see the close-out value of any of your open trades. As soon as you place your bet we will give you a moving offer price for your bet and if the market goes your way you can cash in to secure an early profit. Or if the market turns against you then you can cut your losses and close out early and get some of your stake back. All the tools to help you bet. Their interactive graph allows you to clearly view the movement of various Financial Markets and also track the progress of any open bets you may have placed. You can also view the trading history of the selected financial market for the current day, last 3, 6 or 12 months. Stay ahead of the pack with their live news updates from the Dow Jones. Their live news feed function on Day Trader keeps you up to date with the latest news stories relating to important financial announcements. Be amongst the first to be in the know and make informed decisions when trading financial markets. Still not sure which way to bet? Use this simple graph that shows you how their customers are currently betting on markets and you can choose to follow the crowd or buck the trend and take your own opinion. Day Trader is now available on your iPad! Download Day Trader now on the iPad and make money on the move! You can use Day Trader anywhere with 3G or WIFI, do not delay download the app and start winning on financial markets today. With Day Trader William Hill is so confident in the quality of this product that they will offer you a Risk Free trial. If you are unable to make a profit in your first days trading then William Hill will refund up to £25 of your first days losses. 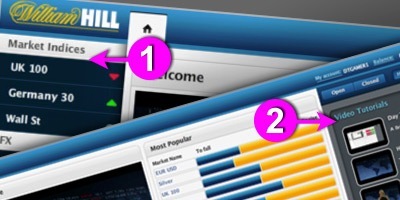 "Day Trader: New WilliamHill.com Financial Betting Service "